On December 29th, 2005 @ approx. 6:30am, I went at Wal-Mart’s photo centre website at http://www.walmartphotocentre.ca/. They had a special offer listed which stated, “$0.12 cents per picture size 4x6 if you order online. The ad also stated that the prints would be ready within 1 hour and for post cards it would be ready in 4 hours. A video capture of the ad on the website is shown above. Being excited that such an offer exists, I ordered picture prints as well as Christmas & New Years postcards. Since this store was opening at 8:00 am, I expected that the prints would be finished by 1 pm max. However, it seems that my expectations for these prints to be done were too much for Wal-Mart to handle. I went to the store and one of the associates at the photo lab told me that they have never received my order. On a second attempt to get my prints, I called the day after and spoke to another associate and he said he can't find the order and advised me to re-upload it online. I find this as an inconvenience since, it took me a long time to edit the pictures and to have them the way I wanted them to be. As compensation for the inconvenience, the associate told me that he will only charge me for one order and give me the other previous order free of charge. Once I got home, I uploaded the image for the post card prints again and called to let him know that I have done so. He found the order and advised me that this will be ready in one hour. I arrived at Wal-Mart at approximately 5:30 pm since I placed the new order at around 3:30 pm. asking for my prints, the same associate told me that he ran out of picture paper. I was waiting for approximately 20 minutes till the associate got back from getting picture paper inside the store. Hoping that this will finally solve my dilemma, my problem went into a different direction. The associate is now telling me that whenever he tried to print out the order, a server error always comes up on his screen. Instead of my problem being solved, it was deferred and I felt as though I was being tricked. I was very frustrated. I spent 3 days and I wasted a lot of my time. The worst part, however is New Years is over! My plans all got screwed up and couldn't deliver the post cards on time, despite the fact that Christmas was over; my parents still wanted me to send these to my relatives overseas. 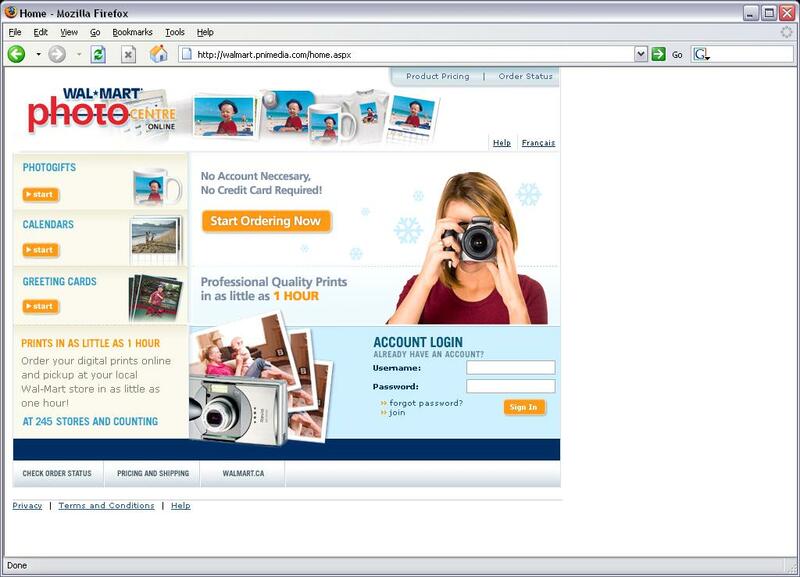 From this experience I learned never to use Wal-Mart’s Online Photo Website when it comes to uploading and/or order images online. It is because that I find the service very unreliable and quiet a hassle. In addition to my problem, the two associates that were working at the Wal-Mart Photo Lab advised me that they do know and also disagree that walmartphotocentre.ca states that regular photos would be ready in 1 hour and post cards would be ready in 4 hours which is wrong and misleading and it is NOT possible to get these prints done on the time as it was promised online!. January 2nd,2006 9:24 pm, I called and spoke to the store manager at the above Walmart location and asked him for the name of the district manager of their photolab, he did not have the contact info for the district manager so he gave me the name of the manager, and advised me to contact her tomorrow in the daytime between 9am - 4pm. January 3rd,2006 @1:02pm, I called the store manager at the above Walmart location and the lady advised me that they can not guarantee when the prints will be completed if ordered online through the website even if the website says it will be ready for pickup in 4 hours as you can see above, advised her that I would like to speak to the district manager, I am now awaiting for a call from them. 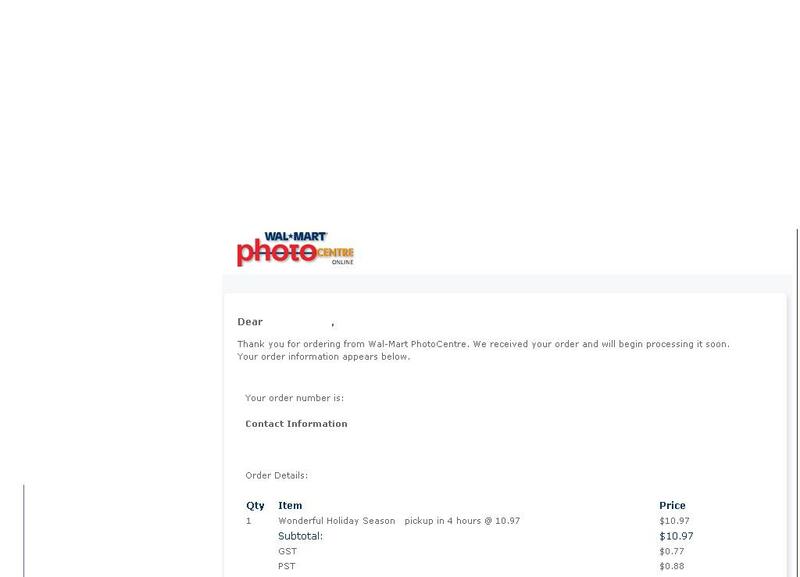 @2:26pm I got a call from a lady and she said that she had spoken to the store manager at the above Walmart location and the only thing the store can do is print this $10 order free of charge, the walmartphotocentre.ca company can't do anything themselves! This matter is currently in the process of being solved by the Photolab Region Manager from January 6th,2006. January 24th,2006; Matter was settled by the Photolab Regional Manager of Ontario. It is the biggest compnay in the world!! There is a reason for this. someday we wont have anywhere else to shop if they keep growing and eating up all the other shops. I agree guys. Your insights are quite true. They are real a-holes at wal-mart. I was in there buying a new spinner belt kit and the teenager at the till made fun of me. He made me feel like an idiot. Thats ok though, I told his manager that he offended me and my spinner belt kit!